I've decided that for the Rogue One premier I'm going to make Mon Mothma's costume. Mon Mothma shows up in Return of the Jedi, and her costume is in the Original Trilogy costume book. For Rogue One we saw her already in the first trailer, and it seemed to make people really happy online. At first glance she was easy to recognize because it seemed to be the same costume, but of course there are enough differences in the ROTJ costume and the R1 costume that it will not be possible to combine them, even if 95% of people will think it's the same. If we start with this side by side shot we can spot a couple of differences between them. 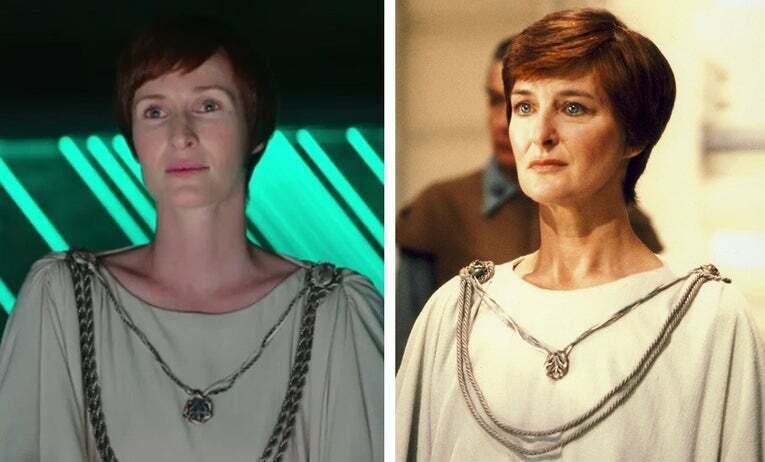 The R1 Mon Mothma, to the left, has a bigger collar, and the collar has piping between the outer fabric and the facing or lining. That silver piping is a big difference. The necklace that she wears is also different. The cords that hold the pendant form a a frame around the R1 version, but they simply go behind the pendant. The R1 Mon Mothma's bigger cords go further down towards the waist, and are made of a shinier cord than the ROTJ Mon Mothma. The top is the ROTJ one, the bottom from R1. Looking Close at both pictures I get the feeling that the R1 costume is made from a lighter and more drapey fabric than the ROTJ one. 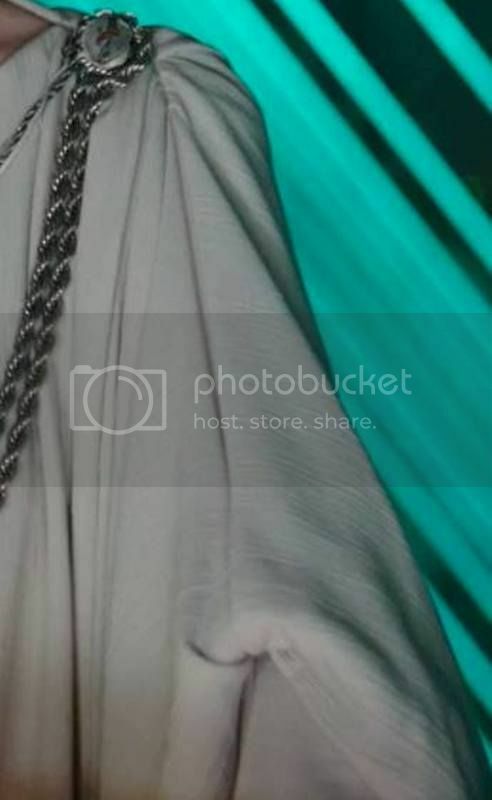 In the middle of the R1 sleeve it's obviously a seam, while the sleeves of the ROTJ Mon Mothma look to be cut in one with the main piece. The ROTJ sleeve has a simple fold about half-way up. The R1 one also has the sleeve but it's also pleated up at the shoulder. The two round emblems that hold the cord are also different. The R1 one button has some kind of pattern on it but is flatter, while the ROTJ one is higher. So yes, the costumes are very similar but with enough differences that I can't combine them. My plan right now is to make the ROTJ costume, since there are still more references for it. I don't think I've seen anything on what the R1 costume looks like from the waist down. Also when I bought the fabric I did it with the ROTJ costume as a reference, and it's too heavy for the R1 costume. I also find it a bit ironic that when I finally find a costume with the exact hair colour that I'm currently using, then it's a costume with short hair. I still need to get hold of a short wig, since I'm not going to cut my own hair off for a costume.